Find out why glorious Windsor Castle is the Queen’s favourite weekend residence! Visit the oldest and largest occupied castle in the world during this afternoon tour and bask in the fortress’s royal setting. Have a peek at the lavish State Apartments and see the impressive artwork hanging on the walls– there are priceless pieces by celebrated painters Rembrandt and Leonardo da Vinci! You will also see the Queen Mary’s Dolls’ House, a beautiful model royal home that features electricity, running water and working lifts – every young Queen’s dream! During the tour you will also visit St George’s Chapel – the resting place for many past monarchs, including Henry VIII and his favourite wife Jane Seymour, Queen Mary, and Queen Elizabeth the Queen Mother. See the memorials and spend some quiet time wandering around this traditional chapel. 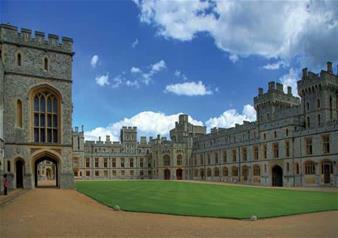 This tour is unescorted and you will spend approximately 2 hours in Windsor Castle. This tour finishes at approximately 6pm/6:30pm in Victoria or Kensington (Gloucester Road). Audio guides are provided in different languages at Windsor Castle: English, French, German, Italian, Japanese, Mandarin, Russian, Spanish. St. George’s Chapel is closed to visitors on Sundays as services are held throughout the day. This tour finishes at approximately 6.30pm in Victoria or Kensington (Gloucester Road).